HTC is finally firing back at Oculus Rift with a $200 price drop on the HTC Vive, bringing the price down to $599! Here’s how the desktop VR options currently compare! The desktop VR wars are heating up with HTC finally responding to two rounds of price drops from Oculus Rift. The Vive and Rift are fierce rivals for the desktop VR market. The largest market share currently belongs to Sony’s Playstation VR, but the PSVR provides a significantly different VR experience — and arguably target market — compared to the Rift and the Vive, which are both designed for high quality VR experiences on PCs. HTC had the early lead due to its superior tracking when the systems were first released. Oculus assumed at first that users would only want front-facing VR experiences and only later on added support for roomscale VR. It would take another few months before Oculus was able to tweak the Rift’s software to provide nearly identical performance to the Vive. But by then, Vive had already built a substantial lead over the Rift. In an attempt to take the lead, Oculus decreased the price of the Rift by $200 in February. Notwithstanding the price difference, it appears from industry estimates that the Vive continued to lead the Rift in market share. This past summer, however, Oculus announced an eye-popping summer sale for $399 for the entire Rift + Touch package, bringing the Rift + Touch to just half the price of the HTC Vive. The summer sale is still going on at the time of this writing but after the sale is over, the price will then be $499 – still a substantial savings over the HTC Vive. No one knows for sure what was the impact of Oculus Rift’s summer sale, but the buzz among users and bloggers seems to be that many first-time desktop VR users decided to snap up the Rift at its $399 price, and those users appear to be happy with their purchase. Meanwhile, Microsoft’s VR headset — rebranded Windows Mixed Reality — is looming, and will be priced starting at $299 when it is released at the end of this year. Besides the price difference, it will also offer inside-out tracking that won’t need external sensors and which could be used for augmented reality or mixed reality, in addition to VR. 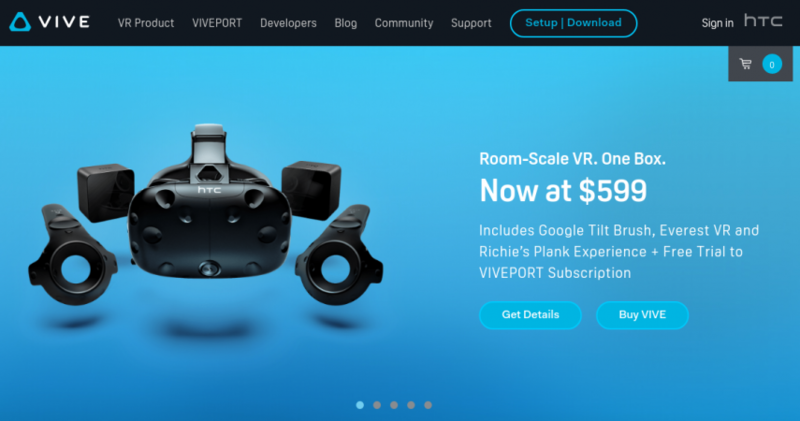 In response to these threats, HTC has now finally decided to drop the Vive’s price to $599. The price drop appears to be permanent. At the new $599 price, it’s still 50% more ($200) than the Rift’s summer sale price, but at least the gap isn’t as gigantic as it was before. As for the Vive and Rift, they are very similar in terms of performance and now even the software. The Rift and Vive can play each others’ games for the most part, except that the controls can be a little bit awkward for one or the other. The Rift has a slight edge on software because there are still a few games for the Rift that won’t readily run on the HTC Vive. By contrast, Oculus now allows Steam VR games to be launched from Oculus Home, making it convenient to play games for the Rift and the Vive. The Rift also has more polished bundled games including the amazing Robo Recall, which was estimated to cost $10 million to develop. However, ultimately, if you don’t mind buying some games that are otherwise free for Rift users, Vive users can enjoy most Rift games. Finally, the Rift also benefits from Oculus’ asynchronous spacewarp, which allows the Rift to run more smoothly on lower-end hardware. My Rift can run on a desktop PC that cost me around $400 all-in. What’s the Vive got going for it then? The biggest difference is ease and convenience of setup. Setting up the Vive is still significantly easier than on the Rift, with less need for long cables. It’s also easier to track a larger play area compared to the Rift. Vive’s lighthouse system has also been selected by many third parties for developing accessories in the future (emphasis on future). Some people also prefer the Vive’s wand-like controls which are similar to holding instruments or objects, compared to the Rift’s controls which are designed to simulate hand and finger movements. The ultimate question therefore is, whether the Vive’s easier tracking and setup (and your possible preference for wand-like vs. grip-like controls) are worth the $200 price difference (plus the cost of any bundled Rift software that you plan to buy, e.g., Robo Recall). That’s entirely your call. To me, you can’t go wrong either way. Oculus Rift + Touch ($399) is available from Amazon. B&H isn’t selling the Rift at the time of this writing. Playstation VR Launch Bundle ($499) is available from Amazon or from B&H Photo. HTC Vive ($599) is available from Amazon. B&H is selling Vive parts but isn’t selling the Vive at the time of this writing. Thank you very much for using the links above to support 360 Rumors at no additional cost to you, so I can do more tests and reviews! One reason not to buy the Rift is the fact that Facebook owns Oculus. Facebook is a company that earns money by getting as much data about their customers as possible. Many people are not comfortable with that. I’ve got my Rift month ago on sale and I’m preparing my in depth comparison video between Rift and Vive. Great news that price dropped more people will be thinking about which one to buy. If you don’t mind I would like to disagree about easier setup of Vive. 3) I hate Vive’s breakout box. If you have some problem with connection you have to make 2 times more checks in and out of breakout box. With Rift it’s just a normal one side connection. Maybe the reason for this was making it possible for Vive user to extend cables for longer distances (10-15 meters) but who would need that in ordinary room? So for my opinion in terms of easier setup in normal room or office Rift is a clear winner. Thanks Akmal. I appreciate your sharing your experience! It’s true that normally you need to attach the Vive mount to the wall (I used a light stand). At the same time, if you only put the Rift sensors on a tabletop in front of you, you’ll only get front-facing VR. If you only want front-facing VR, then you can do the same thing with the Vive (although you’ll need to buy mini stands). The more challenging part is roomscale VR. For Vive, the lighthouses just need to be connected to a power outlet. On the Rift, I have to connect the sensors to the PC, so there will be long USB extension cords. That’s why I personally prefer Vive for setup, especially for larger rooms. But it’s true, Vive software setup is sometimes buggy / less predictable. It’s my pleasure to share my expirience with 360rumors community! About room scale VR. I had no issues with 2 sensor on table in a 2×3 meters zone. The only thing is that when you completely turn around (stand with your back to sensor) Rift loses your controllers but your body most of the time still keep tracked. And most of the time I don’t need too turn my body that much. I agree if you need most accurate body tracking you need to get Vive but for more day to day usage (games, 360 content) Oculus is better choice I guess. Wow great tutorial! Didn’t know it will work with 2 sensors. Have you tried to make 3 sensor setup after that? Hi Akmal. Yes I tried with 3 sensors, it was only a slight improvement for me, so I sold my third sensor. I broke down and got the Rift before the Vive sale. I came to the conclusion that the two were enough alike that it would be worth it at $400. To my surprise, the Rift is very usable in front facing mode alone but I will try mounting the cameras on light stands in the future. That said I was not happy to hear about the Vive dropping in price a week later. If I waited a little longer I may have gone with the Vive. My room is small, however, So I am sure the Rift will meet my needs this VR generation. I might buy my games from Steam to ensure compatibility with other headsets in the future. In the end, I agree that there is no one real right or wrong choice. Hi Denzel. Congrats on getting the Rift! I wouldn’t worry at all about the Vive. The Rift is great in itself – and you still saved at least $200, even with the Vive price drop, not including the cost of the Rift’s software like Robo Recall, etc. Thanks also for the info on MS Mixed Reality headsets! It has been revealed that Microsoft is working with Valve to make sure SteamVR works with MR headsets. Hopefully, this will mean there will be three good desktop VR systems by the end of the year! Thanks for the update, Denzel! Yes I hope Windows Mixed Reality supports Steam VR as well. In your experience which is the best headset to play high res & quality 360 3d video in a tourism office to show the most beatiful places to the office visitors in the most outstanding way? One of my best customers is a tourist body and I’d like to setup a virtual tourist office room with 360 3d videos (made with cameras like Insta 360 Pro). By my expirience I have mixed feelings about Image quality on both headset. Vive has – bigger field of view and focus wheel to adjust diopters. On the other hand Oculus have interpupilary distance adjustment and a bit less visible pixels. If 360 video content is your thing I’d suggest GearVR It’s my personal favorite in terms of quality and ergonomics. It lacks of body tracking but you can’t do a lot in photo and video. But if you plan to show them 3D mapped locations (like Realities app) in near future than you should choose between Rift and Vive. Good advice. The only thing I differ with is for ergonomics, I prefer Oculus Rift. It feels lighter and more balanced. Gear VR feels front-heavy. Vive field of view is nice but it’s heavy and some old customers might feel a neck ache. Yeah Rift is the only headset that not put a pressure on your nose. They did something with it so it really feels more balanced on the head. Maybe heaphones has some counterweigh function. Thanks Akmal. Yes I like the ergonomics of the Gear VR. Yet there are some who don’t like it, like Ben Claremont for example — he found it too heavy and his neck was strained. Wow 2 hours? You have strong VR legs! 🙂 For me it’s easier to watch for longer periods of time on Rift because of the positional tracking, which makes me less dizzy. Hi Giorgio. Among readily available options, I think it would be Gear VR, using S7 or S8 (not S8 plus) because of the pixel density. The client must be in a swivel chair for best results. For better comfort at slightly lower resolution, Oculus Rift is a good option too. Samsung Note 8 specs leaked; will it have a 4K display for amazing VR?